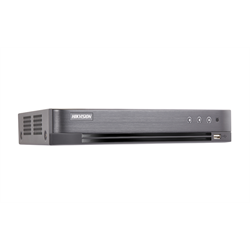 The Hikvision DS-7204HUI-K1-P-2TB TurboHD is an HD-TVI/analog 4 channel DVR that uses the latest H.265+ encoding technology, which improves recording efficiency and reduces the size of data being stored. It has a transmission distance of up to 2,630 ft (800m) on 1080p, and 3,940 ft (1,200m) on 720p HD-TVI. The DVR can support images recorded in up to 5 megapixels in 1080p and comes with an HDMI and VGA output up to 3840 x 2160. It comes with 1 SATA interface that can house a hard drive up to 8TB. Comes with a 2TB hard drive. Cameras can be powered using a 12V DC/48 VDC power supply or using Power over Coax, which allows analog cameras to be powered by the DVR using a coax cable. The DS-7204HUI-K1-P-2TB an ONVIF compliant model which means to can be paired with cameras from other brands that are also ONVIF compatible. It’s always advised, however, to pair Hikvision cameras with Hikvision DVRs.